In 1989, a cover of Gerry & The Pacemakers’ Ferry ‘Cross The Mersey, credited to the Christians, Holly Johnson, Paul McCartney, Gerry Marsden, Stock Aitken & Waterman, topped the UK chart with all proceeds going to the victims and their families of the Hillsborough disaster. The lead credit on the Liverpool line-up was The Christians because, as lead singer Garry Christian remembered, “It was because we were the only act in the chart at the time.” It actual fact, they hadn’t had a hit for six months when a cover of the Isley Brothers’ Harvest for The World had made number eight. 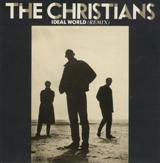 In reality, the week the song entered the chart at number one, Holly Johnson had just dropped out of the top 10 with Americanos and Paul McCartney had a new entry with My Brave Face, but it’s not that song I’m looking at this week, it’s the Christians’ first top 20 hit, Ideal World, from 18 months previous. The band were formed in 1985 by the three Christian brothers – lead singer Garry, bassist Roger and keyboardist Russell, The fourth member was guitarist and keyboard player Henry Priestman whose middle name was Christian, but two years after forming Roger left because he didn’t want to go on tour. How did Garry get into music? “It was as a boy growing up in Liverpool that my passion for music was first ignited,” he said. He is one of 13 children most of whom would often sing together at home, one of his sisters briefly dated John Lennon. Garry occasionally stole his siblings’ records – The Mills Brothers were a favourite, but it was when he saw his older brothers, Dennis and Roger, leaving the house to do gigs it made Garry want to pursue a professional career. He said: We loved entertainment at home and there were four of us brothers who used to pretend to be The Four Tops. We had a great time but I really wanted to be able to go out there like my brothers. They were performing in front of actual audiences. I thought it was amazing and I really wanted to be there with them. The Christians made some great singles. Up there with Forgotten Town, I Found Out, Born Again, When The Fingers Point, Harvest For The World, although my favourite one is Hooverville … so many great singles, yet ignored by radio now.